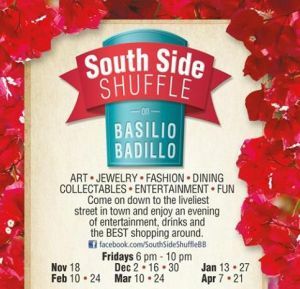 The South Side shuffle, now in its 7th year, gives everyone a great excuse to shop at the 17 participating businesses on Basilio Badillo and Constitutión streets, while enjoying cocktails, music and entertainment. Puerto Vallarta, Mexico - Starting Friday, November 18, 2016, and every other Friday through April 21, 2017, Puerto Vallarta's Zona Romantica comes to life from 6 to 10 pm as locals and tourists alike head over to Basilio Badillo to do the South Side Shuffle. Filled with art galleries, shops and boutiques that offer everything from fine art and Mexican pottery to folk art, jewelry and resort wear, PV's south side has been known as one of the best shopping areas in Vallarta for almost 30 years. And the South Side shuffle, now in its seventh year, gives everyone a great excuse to shop at the 17 participating businesses on Basilio Badillo and Constitutión streets, while enjoying a perfect mix of culture, cocktails, music, hanging out with old friends and making new ones. As not all of the businesses along the route are galleries, it is not an art walk; nevertheless participating galleries like Galleria Dante, Ambos Galería and Peyote People will be showcasing individual artists throughout the season. Along the way you can stop for a bite to eat, a cocktail and conversation, or to dance to the music provided by strolling musicians. What is more, it is safe to walk these streets at night, which means locals and visitors are at ease while enjoying the only ongoing party of its kind in all of Puerto Vallarta. The fiesta hits the streets every other Friday from 6-10 pm, so come on out and enjoy cocktails, live music, and "Shuffling" between 17 participating businesses on Basilio Badillo and Calle Constitución on the South Side of Puerto Vallarta. In addition to the South Side Shuffle's 17 participating businesses, there are also many other wonderful shops, restaurants and galleries in the vicinity that are not to be missed while enjoying these bi-weekly events, scheduled to take place November 18, December 2, 16 & 30, January 13 & 27, February 10 & 24, March 10 & 24 and April 7 & 21, 2017.